We will add information here to help you understand all of the impacts on our Watershed. large, visible masses of algae that develop in bodies of water during warm weather. Algal blooms are the result of excessive levels of nutrients (generally phosphorus or nitrogen) in water. the point at which the flow just begins to enter the active floodplain. Accurate measurements have been conducted on gaged streams, however, in absence of historical hydrological records there are a number of field indicators that can be used to identify bankfull stages with a great deal of accuracy: • An abrupt change in the slope of the stream channel, usually from a vertical plane to a horizontal plane on top of the floodplain. • The bankfull stage is usually marked by a change in vegetation such as the change from gravel bars to forbs, herbs, or grasses. Persistent woody vegetation is usually indicative of upland terrain, but can be misleading. • Erosion or scour features. These features indicate areas just below the bankfull stage and are recognized as significant characteristics of stream dynamics. • Flat depositional benches, lateral bars, or point bars, usually created by lateral or downward movement of streams and can create active floodplain areas. • Change in the size distribution of sediment materials at the surface from fine gravel to cobbles, from sand to gravel or even fine gravel material. It can change from fine to coarse or coarse to fine. • Stain lines can indicate frequent inundation of water on rocks. Stain lines may be marked by sediment or lichens. Yield. Total water runout or crop; includes runoff plus underflow. Runoff. That part of water yield that appears in streams. Streamflow. The actual flow in streams, whether or not subject to regulation, or underflow. Each of these terms can be reported in total volumes (such as acre-feet) or time rates (such as cubic feet per second or acre-feet per year). The differentiation between runoff as a volume and streamflow as a rate is not accepted. Strip of natural vegetation growing parallel to a stream that provides wildlife habitat and an erosion and flood buffer zone. This strip of vegetation also retards rainfall runoff down the bank slope and provides a root system that binds soil particles together. are mainly artificial structures—such as pavements (roads, sidewalks, driveways and parking lots) that are covered by impenetrable materials such as asphalt, concrete, brick, stone, and rooftops. Large Woody Debris (LWD)- Natural wooden structures (logs) placed along the banks of rivers/creeks to improve aquatic habitat. Methods vary, but it simply means placing logs into the river. 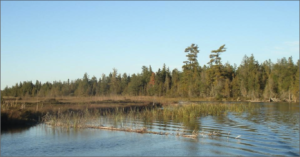 LWD application in Grass River: Non-point sediment threatens the navigability of the river. Hypothesis: Log structures will reflect some of the flowing water and cause subtle shifts in water current direction and velocity, resulting in deeper pockets and channels forming as sediment is scoured from the riverbed around the structures. A lake which has one mixing and one stratification event per year. If a lake does not freeze over in the winter, the winter winds will mix the waters of the lake. In summer, the lake resists mixing and becomes stratified because the surface waters are warm (light) and the bottom waters are cold (dense). non-point source (NPS) pollution–pollution discharged over a wide land area, not from one specific location. These are forms of diffuse pollution caused by sediment, nutrients, organic and toxic substances originating from land-use activities, which are carried to lakes and streams by surface runoff. 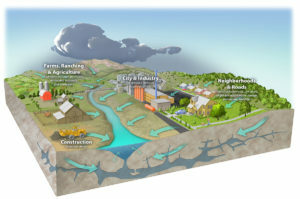 Non-point source pollution is contamination that occurs when rainwater, snowmelt, or irrigation washes off plowed fields, city streets, or suburban backyards. As this runoff moves across the land surface, it picks up soil particles and pollutants, such as nutrients and pesticides.